Competition is a primal urge. It’s part of civilization’s foundation. The catalyst of progress. Our society is enriched because people compete. So can you love competition and community equally? For us, the answer is yes. People were designed to be in communion with one another. We are not meant to be alone. Our quality of life is elevated by strong connection with family and friends. Life is better when it’s lived alongside, and for, others. SO WHAT IS COMMUNITY OVER COMPETITION? So let’s talk about the buzz-word that is community and the phrase delivered alongside of it— “community over competition”. The phrase is rightly ordered — it’s putting relationships before opportunity. It’s a level of understanding that the most successful businesses are those that serve others. Their customers/members/guests have a more enriched life because of the company’s product or services. Competition is healthy when it’s not at the expense of others. It was never meant to hold people back or put people down, but to push people forward–in both winning and losing. Competition is a healthy part of life, but life is not a competition. Life is about relationships. The best businesses aren’t those who are concerned with how much of “the pie” their competitors are taking; rather, the best businesses are concerned with how to best serve their customers. This means business is inherently community-based. And–to be clear–people will “lose.” Businesses will fail. Some won’t find their niche and others won’t manage their businesses well. And some will fail before they start because their owners don’t believe they can do it. Unfortunately this often because others told them they couldn’t. But there is a difference between a business failing because it did not find it’s niche or didn’t serve its clients well, and a business failing because other business owners were discouraging or deceptive. Community over competition isn’t a call to prop up businesses that don’t serve others well. It isn’t a call to undercut the competition, or to accept some form of fallacious, deprecative humility where you put yourself down to lift others up. But it is a call to serve others. To love people well. Putting your money where your mouth is and living out collaboration over competition does sometimes run counter to our nature. We aren’t good at it sometimes. (See: people fail.) Yet, we all have the audacity to overuse the trending hashtag. Jealousy and resentment of others’ successes may be a “normal human response,” but it does not mean it’s a good response. We should strive to enter into other people’s joy. One of the most simple ways to live out this philosophy is to practice gratitude. When we're thankful, we're rarely fearful. And when we’re not fearful, we’re not insecure. When we’re thankful, we’re full, and we share that spirit of abundance with others. One of the most impactful contributions our business can make is in the form of our standing Community Sweat. It happens every Friday at noon at The Suffolk Punch. We showcase a different trainer in the CLT area. We support their journey, their goals, and partner with them in the spirit of becoming stronger together than we are apart. All fitness levels welcome. We set an intention for the afternoon, we accelerate with a sweat, and reflect afterwards while breaking bread and cheers-ing beers. What could be wrong with that? 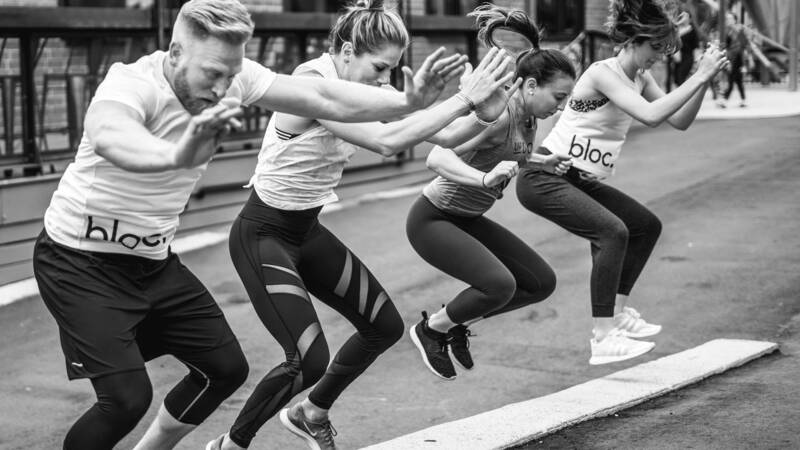 Welcome to bloc. From our Masters to our Members, it’s a shared mindset: keep moving. We would like to invite your authentic self to a space where you can let your guard down; sweat, sip, recover, connect.